When: Saturday 13th October. 10am till 4pm. 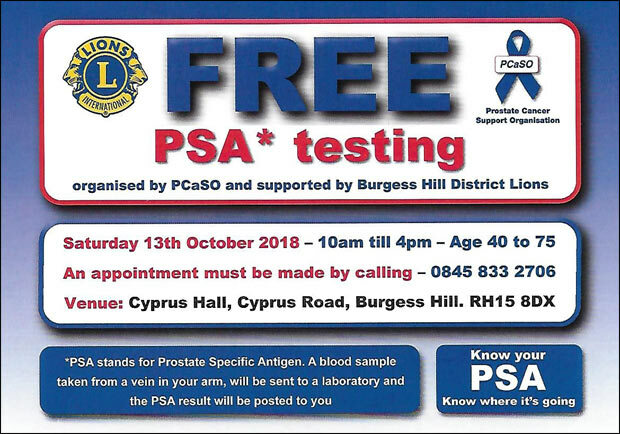 This will be the third year that the Burgess Hill and District Lions have arranged for PSA blood tests to be taken. Unfortunately Doctor Surgeries do not offer this test so a man has to insist and show a family history of cancer before most doctors will offer an annual test. In October 2016, a total of 280 men were tested and 28 received results that required them to visit their GP for further tests. One was a member of the Lions Club and he was told that having a PSA test probably saved his life. He had none of the normal symptoms and was totally unaware that he had Prostate Cancer. Thankfully he has been treated and is now clear of the cancer. In October 2017 a total of 342 men were tested with 30 receiving higher than normal readings so needing further tests. The Lions are hoping to test another 340 men again this year. All men need to book in advance by telephone. Organiser Alan Ranger said: "We are convinced that these test days really do save lives and we hope to be able to continue funding events on an annual basis. Each test day costs approx. £3,500 which comes from the proceeds of our Book Sales."